love the Cypriot audience has shown to the company, along with the high recognition it gained throughout the years, have also given it the impetus to start specializing in the preparation of corporate and multi- occasional (i.e. wedding, christening, birthday, visit) gift boxes. Today, Gourmet Grocery CY’s a leading company in luxury gifts. Within its privately owned facilities, other than selling its products individually, is also preparing custom-made packages (with customized logos on), based on the client’s needs and preferences. Its uniquely crafted boxes contain an exclusive selection of the most premium gourmet products, carefully selected, and customized especially for the client. 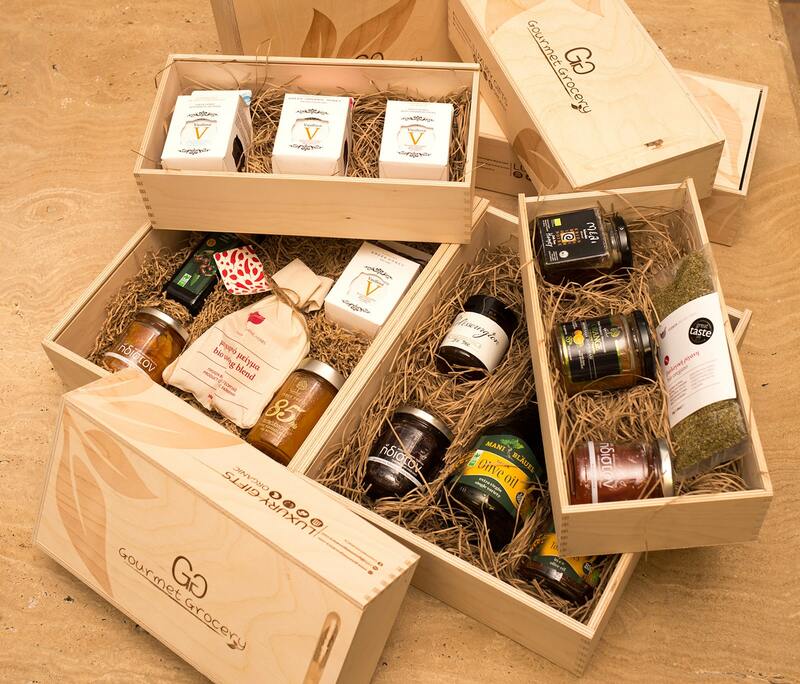 The philosophy behind Gourmet Grocery’s gifts is to provide something that distinguishes for its unique attributes, high standards and quality, whilst addressing the tastes of the discerning clients and their loved ones. Most of its products to contain into the boxes are multi-awarded, natural Hellenic products, paying tribute to nature with the utmost respect (i.e. organic herbs and honeys, extra virgin olive oils, bio/stevia spreads, soaps, wines) – but the company has visions to incorporate Cypriot products, as well, redesigning their package and channeling them in the market, in a gourmet-fashioned way. Gourmet Grocery Cy’s gifts are undoubtedly an alternative choice, and one that will satisfy their receivers! Visit us at 173 Kranidioti Giannou Av. in Latsia, Nicosia, Cyprusto design yours, or customize them instantly on our gift-shop. On our gift-shop, you may also find a quantity of pre-customized gift boxes, in a variety of sizes and prices! Once your package is ready, we will deliver it to you or your loved ones anywhere in the world!